Background A substantial number of children experience spinal pain, that is, back and/or neck pain. Today, no ‘gold-standard’ treatment for spinal pain in children exists, but manipulative therapy is increasingly being used in spite of a lack of evidence of its effectiveness. This study investigates the effectiveness of adding manipulative therapy to other conservative care for spinal pain in a school-based cohort of Danish children aged 9–15 years. Methods and findings The design was a two-arm pragmatic randomised controlled trial, nested in a longitudinal open cohort study in Danish public schools. 238 children from 13 public schools were randomised individually from February 2012 to April 2014. A text message system and clinical examinations were used for data collection. Interventions included either (1) advice, exercises and soft-tissue treatment or (2) advice, exercises and soft-tissue treatment plus manipulative therapy. The primary outcome was number of recurrences of spinal pain. Secondary outcomes were duration of spinal pain, change in pain intensity and Global Perceived Effect. We found no significant difference between groups in the primary outcome (control group median 1 (IQR 1–3) and intervention group 2 (IQR 0–4), p=0.07). Children in the group receiving manipulative therapy reported a higher Global Perceived Effect: OR 2.22, (95% CI 1.19 to 4.15). No adverse events were reported. Main limitations are the potential discrepancy between parental and child reporting and that the study population may not be comparable to a normal care-seeking population. Conclusions Adding manipulative therapy to other conservative care in school children with spinal pain did not result in fewer recurrent episodes. The choice of treatment—if any—for spinal pain in children therefore relies on personal preferences, and could include conservative care with and without manipulative therapy. Participants in this trial may differ from a normal care-seeking population. Trial registration number NCT01504698; Results. The school-based design minimised social bias and provided equal access for all. The prospective open cohort design allowed for a long follow-up period. The text message (SMS) track system is very efficient in collecting frequent data over a long time. The SMS track reflects how often parents reported spinal pain on behalf of the child, but this may not reflect the experience of the child. The inclusion criteria of a Numerical Rating Scale score of 3 or more on the day of examination and pain for at least 3 days is probably below the normal pain intensity threshold for seeking treatment. Spinal pain is common in children and adolescents and prevalence rates reach adult levels already around the age of 18.1 For most children, episodes are transient and inconsequential, and therefore, the area has been largely ignored in research. However, some children have frequent, recurrent and bothersome complaints,2–5 impacting their mental well-being6 and with the potential to decrease the level of physical activity. Importantly, these problems seem to track into adulthood, that is, the most affected adolescents grow up to be the most affected adults.7 8 Therefore, proper management at an early stage is essential to improve lifetime trajectories of spinal pain. The aim of this pragmatic RCT was to determine the effectiveness of adding MT to other conservative care (advice, exercises and soft-tissue treatment) on the number of recurrences of spinal pain in children aged 9–15 years who were participating in a school-based open cohort study. Secondary outcomes included the short-term effect on duration of spinal pain episodes, pain intensity and Global Perceived Effect. A pragmatic parallel observer-blinded RCT nested in a school-based open cohort. This study was nested in The Childhood Health, Activity and Motor Performance School Study Denmark (CHAMPS Study-DK),21 which is a Danish longitudinal school-based open cohort study including approximately 1400 children aged 9–15 years from 13 public schools. The CHAMPS Study-DK was an open cohort study hence children could enter or leave the cohort at any time during the study period. The children were followed weekly with text messages (SMS) to one of their parents inquiring, among other things, about any musculoskeletal pain the child might have had during the past week (questions in online supplementary file 1). Data collection on musculoskeletal complaints for this RCT began in February 2012 and ended at the end of June 2014. All children enrolled in the CHAMPS Study-DK were invited to participate in the RCT. 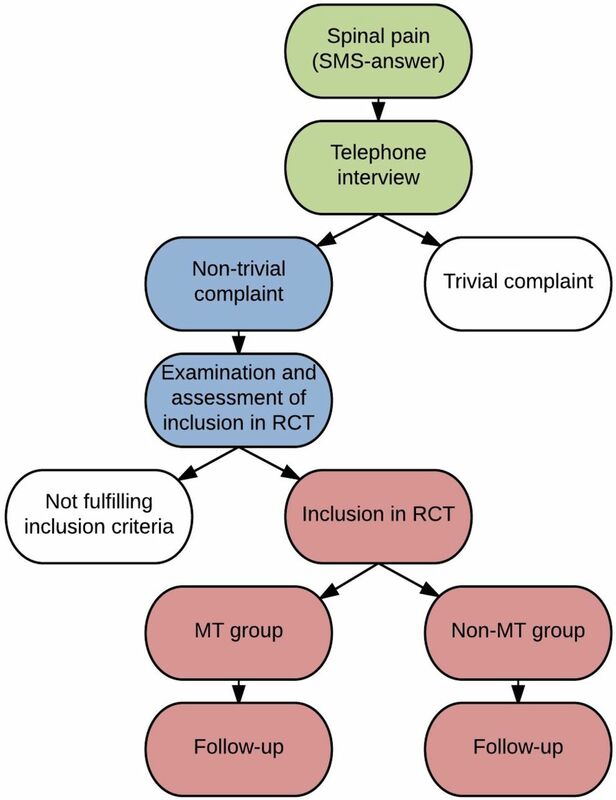 The complete protocol for the RCT is described in detail elsewhere.22 Briefly, when a parent answered positively on the SMS to the presence of spinal pain in their child, a member of a screening team (licensed chiropractors and physiotherapists) telephoned the parent and conducted a standardised interview about the complaint, in order to determine whether the child was eligible for inclusion in the RCT. Initial eligibility was based on: (1) the pain was spinal and still present at the time of the interview, (2) the parent had agreed, on behalf of the child, to join the RCT and (3) the child had not had any manual treatment of the spine during the previous 2 months. Within 2 weeks, the child was evaluated at the school by a chiropractor from the RCT team (seven licensed chiropractors) to determine whether he or she fulfilled the inclusion criteria (table 1). After the evaluation, both the child and his/her parents were informed about the results and treatment was initiated. The flow from SMS to RCT can be seen in figure 1. Flow from SMS to RCT. MT group, manipulative therapy group; RCT, randomised controlled trial; SMS, text message. A computer-generated block randomisation was made with block sizes alternating between two and six at the time of inclusion, using a 1:1 allocation to the two groups. The consecutive designations of the two groups were written on separate pieces of paper and given to the chiropractors in the RCT team in sealed opaque envelopes. A research assistant, who was not otherwise connected to the study, performed the procedure. At the first consultation, the chiropractor obtained a case history, including pain intensity on an 11-box Numerical Rating Scale,23 performed a clinical examination, and various baseline data were acquired (online supplementary file 2). Two weeks after inclusion, the child was asked about Global Perceived Effect (online supplementary file 3) and pain intensity. If a child experienced a recurrence of pain (ie, the parent-reported pain on the weekly SMS), the procedure was repeated except for randomisation, which was carried forward throughout the study period regardless of the body location in which the complaint occurred. All data were filed in electronic data storage systems established specifically for this project and stored on secure servers. The non-MT group received advice, exercises and soft-tissue treatment, and the MT group received advice, exercises and soft-tissue treatment plus MT (table 2). Both groups were treated by the RCT team consisting of seven chiropractors. MT was defined as high velocity, low amplitude manipulation and/or mobilisation of the joints to restore segmental spinal motion.10 This was delivered at the discretion of the chiropractor and applied on the basis of a combination of biomechanical dysfunction and pain provocation responses found during the clinical examination of the child,10 since palpatory findings by itself have been found unreliable.24 If the child experienced any pain in the extremities during the study period, these were also treated with MT at the discretion of the treating chiropractor. Because of the pragmatic nature of the study, the frequency and content of treatments in both groups was determined by the treating chiropractor at each visit, similar to what is normal in clinical practice. Because the RCT team consisted of seven chiropractors, a child could be treated by different chiropractors during different appointments. Treatments continued until the child no longer had any symptoms related to the musculoskeletal complaint, or until the chiropractor or parent decided that further treatment was not indicated. The child and/or parents could terminate the treatments or drop out of the RCT at any time during the study period, but still stay in the cohort of the CHAMPS Study-DK. Due to the nature of the intervention, blinding of the treating chiropractors was not possible, however, neither parents nor children were informed about group allocation and parents did not attend treatment sessions and answered the SMS without contact with clinicians or researchers. The coding of the intervention group was not revealed to the primary investigator or the statisticians until after the analyses had been completed. The primary outcome was the number of recurrences as measured via the weekly SMS messages. A recurrence was defined as a new episode of spinal pain (ie, back and/or neck pain) occurring after at least 1 week without spinal pain following the end of the previous episode (see secondary outcomes, table 3). A sensitivity analysis was conducted to assess the effect of the choice of definitions in relation to recurrence and duration in the present study. In this analysis, a new episode was defined to occur after 4 weeks of ‘no pain’ instead of 1 week before it was considered a new episode. STATA V.14.2 (StataCorp) was used for data analyses. Significance level was set to 5%. A child could be withdrawn from the study at any time during the study period and the study was conducted according to the Declaration of Helsinki. There was no patient involvement in the formulation of the research question, the choice of outcome measures, the design, the recruitment procedures, conduct of the study or assessment of the burden of the intervention. Parents of the included children will receive information about the study and its results via newsletters and the project’s website. The inclusion period ran from 1 February 2012 to 1 April 2014, and the follow-up period ended on 27 June 2014 (the end of the school year). Follow-up time was defined as ‘Number of days between inclusion date and last SMS’. Since one child left the study the day after inclusion, this resulted in 1 to 868 follow-up days, (mean 477 days; SD 233). A total of 770 children reported spinal pain on SMS, and after telephone interviews, 483 children were evaluated for eligibility but did not fulfil the inclusion criteria. Additionally, 44 individuals reported pain less than 3 on the Numerical Rating Scale on the day of examination, leaving 243 children randomised and enrolled in the study. During data cleaning, we found five participants had been wrongly included, that is, the SMS answer indicated no spinal pain, and they were excluded from the analyses. Thus, the final cohort for analysis consisted of 238 children with a mean age of 12.6 years: 116 in the non-MT group (49%) and 122 in the MT group (51%), (see figure 2). CONSORT flow diagram. CONSORT, Consolidated Standards of Reporting Trials; MT,manipulative therapy; NRS, Numerical Rating Scale; SMS, text message. Baseline covariates can be seen in table 4, which also reports the amount of missing data for each variable. There was no difference between the groups for any of the covariates indicating randomisation was successful, and therefore, univariate analyses were performed for all analyses. During the follow-up period, 175 (74%) of the children had a total of 592 recurrences, ranging from 1 to 21 recurrences per child. The median number of recurrences was 2 (IQR 0–4) for the MT group and 1 (IQR 1–3) for the non-MT group, revealing no statistically significant difference between groups, incidence rate ratio 1.26 (95% CI 0.98 to 1.61), p=0.07. We found no significant difference in the average episode length, total number of pain weeks or change in pain intensity between the two groups. Children in the group receiving MT reported a higher Global Perceived Effect: OR 2.22, (95% CI 1.19 to 4.15), that was statistically significant. All results are displayed in table 5. The number of recurrences declined from a total of 592 to 259 when we defined a new episode to occur after 4 weeks of ‘no pain’ instead of 1 week. This, however, did not change the between-group difference on either the primary outcome or most of the secondary outcomes, but it did result in a statistically significant increased length of episode for the MT group, mean 3.5 (3.0–4.0) vs 4.4 weeks (3.8–5.0) and median 2 (1–5) vs 2 (1–4), p=0.045. Adverse events can be defined as the sequelae following MT to the spine that are medium to long term in duration, with moderate to severe symptoms, and of a nature that is serious, distressing and unacceptable to the patient and requires further treatment25 To our knowledge, no adverse events following MT have been reported in children of this age group.26 27 However, it is common to experience transient side effects such as temporary reddening or soreness in the area being treated after both soft-tissue treatment and MT.28 Treating chiropractors recorded transient side effects if the child stated these at the consultation, but none were reported and no child was referred to other healthcare providers, including general practitioners, because of adverse events. Adding MT to other conservative care for children reporting spinal pain did not result in fewer recurrences in a school-based cohort of Danish children aged 9–15 years. Furthermore, the average episode length, total number of pain weeks and change in pain intensity were no different between the groups. However, in the sensitivity analyses, filtering out the frequently recurring episodes, the difference for episode length did become statistically significant. Children randomised to the MT group reported a higher Global Perceived Effect that was statistically significant. Thus, no increased effectiveness was evident and no harm was detected. To our knowledge, this is the first RCT evaluating the added benefit of MT in children with spinal pain (ie, back and/or neck pain). Michaleff et al 29 found only four RCTs dealing with conservative interventions for low back pain in children and all had a high risk of bias. Only one of these included manual therapy combined with exercise, but it had only 45 participants. Because this study was a two-armed parallel trial with MT as an addition to other conservative care, it is probably not surprising that we did not find a large difference between the two groups. This RCT was nested in a large cohort study, and hence we could not prolong the study period to increase the sample size; however, given the small absolute differences found on both primary and secondary outcomes, this is unlikely to have changed our conclusions. We could not find any literature supporting the validity of measures of Global Perceived Effect in children, but validity of this measure has been shown to be good in adults34 35 and we therefore included it as a measure of the child’s own perception of improvement. We would have expected that statistically significant differences between the groups would follow the same pattern for the Numerical Rating Scale and the Global Perceived Effect, but this was not the case. Therefore, the validity of both of these as outcome measures in clinical trials involving children should be further explored. The principal strength of this study was the school-based design, which had a number of advantages: the logistical burden for the parents was reduced because the treatment took place during school time, social bias was likely to be minimal or absent because everybody was invited to participate in the study, and there was equal access because all treatment in the trial was free. Also, this design allowed for a long follow-up period for most children. By nesting this RCT in a school-based cohort, we may however have included children who would not normally have sought care, that is, likely to have had subclinical pain. The inclusion criterion of a Numerical Rating Scale score of 3 or more on the day of examination is probably also below the normal pain intensity threshold for seeking treatment and many parents would probably have waited until the pain had become worse or lasted longer before seeking care. On the other hand, the number and duration of spinal pain episodes were higher in the study sample than in the full cohort (mean number 3.5 vs 2, mean duration 4.6 vs 2.8),36 suggesting that the children enrolled in this study were more affected by pain than their non-participating peers. SMS is a very efficient way of collecting frequent data over a long time.37 38 In this study, the SMS responses were a reflection of how often the parents reported on their child’s pain and might not have been a true reflection of how the child actually felt. We know that there is a discrepancy between parent and child reporting of spinal pain.39–41 Parents appear to under-report compared with their child when pain is at a low level, whereas concordance is higher when the pain is more severe. Thus, it is possible that the parents stopped reporting pain because they assumed the complaint to be minor, even though the child might still have had pain. This could explain some of the difference between outcomes reported by the children (Global Perceived Effect) and outcome reported by the parents (SMS). Using different practitioners prevents a potential patient–practitioner relationship and is considered a strength; however, the more people involved, the more irregularities and mistakes are likely to occur. One example of this is the poor response rate to the measures collected by the clinicians, for example, Numerical Rating Scale and Global Perceived Effect scores. The amount of missing data was substantial for some of the secondary outcomes, and therefore, we analysed only those for the first spinal pain episode. However, there was no difference in response rates between groups, and it was assumed that data were missing completely at random and not due to any underlying confounding factors or bias. Possible reasons for missing data could be practitioners’ forgetfulness or an electronic system defect resulting in missing data. Because of missing data, we cannot say anything valid about the course of pain, for example, whether there is a learning effect over time or whether expectations of treatment differ over time between the two groups. Since the inclusion criteria in this study were very broad, subgroup analyses would be valuable to inform future studies, that is, if there are subgroups of children who respond better or worse to MT than to other treatments. Future RCTs should include care-seeking children who self-report their response to treatment in order to evaluate effectiveness in that population. In addition, inclusion of an untreated group would elucidate the effect of treating these children, whether MT is included or not. We found no significant difference in the number of recurrences of episodes of spinal pain in a school-based cohort of children when adding MT to advice, exercises and soft-tissue therapy. The study population may not be comparable to a normal care-seeking population, and therefore, the results may not be directly transferrable. The authors gratefully acknowledge the Nordic Institute of Chiropractic and Clinical Biomechanics for providing office space and support. Furthermore, we would like to thank Suzanne Capell for proof reading the manuscript. Finally, we would like to thank the participants and their parents and the participating schools, and Werner Vach and Eleanor Boyle for advice in matters relating to sample size calculations and description of the analysis. In addition, we acknowledge all the members of the CHAMPS Study-DK and the clinicians taking part in this study for making it possible.
. At what age does low back pain become a common problem? A study of 29,424 individuals aged 12-41 years. Spine 1998;23:228–34.
. The prevalence of low back pain among children and adolescents. A nationwide, cohort-based questionnaire survey in Finland. Spine 1997;22:1132–6.
. Chiropractic Technique. Principles and Procedures. 3rd ed. Missouri: United States of America: Elsevier Mosby, 2011:35–74.
. Use of complementary health approaches among children aged 4-17 years in the United States: National Health Interview Survey, 2007-2012. Natl Health Stat Report 2015;78:1–19.
. The use of spinal manipulative therapy for pediatric health conditions: a systematic review of the literature. J Can Chiropr Assoc 2012;56:128–41. Contributors All authors (KBD, JH, NW and LH) participated in the design and interpretation of analyses of this study. KBD was project manager for the trial and drafted the manuscript. All authors (KBD, JH, NW and LH) contributed with revisions and approved the final version of the manuscript. Funding This work was supported by The IMK Foundation, The Danish Chiropractic Research Foundation, The Nordea Foundation and The TRYG Foundation, who funded the data collection as well as salaries and equipment for examination and treatment of the children in the RCT. The salary of the first author (KBD) was funded by the Danish Chiropractic Research Foundation and the University of Southern Denmark, in order to complete this project. The other authors did not receive specific grants for this study. Disclaimer The funders had no role in the study design, data analysis, decision to publish or preparation of this paper. Ethics approval The project was approved by The Regional Committee on Health Research Ethics (#S-20110042) and data were handled according to the regulations set by the Danish Data Protection Agency (#2013-41-1738). Data sharing statement Data are from the Childhood Health, Activity and Motor Performance School Study (CHAMPS Study-DK) and are available on request from the project manager Niels Wedderkopp.